1) Tell us a little about who you are. What job do you do? I am an independent filmmaker who makes animations, documentaries and short drama productions shown on festivals or made for TV. 2) Can you describe a recent animation project you’ve worked on? Recently I made the short film Pik (Pecker) for the series “Ultra Kort” (Ultra Short); It played in 70 Pathé cinemas as a supporting program of Shrek IV. Pik combines stop motion clay animation by Patrick Raats with 2D animation by myself. 3) How are the illumations in collaboration with Vijselaar en Sixma made and what is your part in the process? Michiel and Tjarda usually contact me when they’ve made a first sketch for their client. We then discuss the concept and technical issues i.e. what the action will be, which parts will move, what the sound will be, etcetera. After that Michiel and Tjarda start photographing the props and send the separate parts in a Photoshop file. I then use different pieces of software for animation. Most of the sound effects are downloaded from the Internet and mixed together into a fitting sound track. 4) Why do you call them illumations? The word Illumations is a joining together of Illustrations and Animations. It also has the connotation of “illuminating a certain topic” for me. 5) What animation techniques do you use for the illumations? That depends. Usually I work with computer animation (After Effects, Anime Studio). But every now and then I work with stop-motion techniques too. 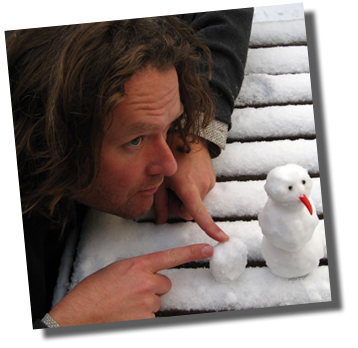 Have a look on the website of Erik van Schaaik to see his animated films.